It's no secret that bloggers get a lot of goodies sent to us; beauty products, makeup, nail polish, you name it... and while I am so grateful that these brands are happy gifting these to me and trusting my honest reviews, it honestly gets overwhelming when it comes to organizing it and having a good storage system. 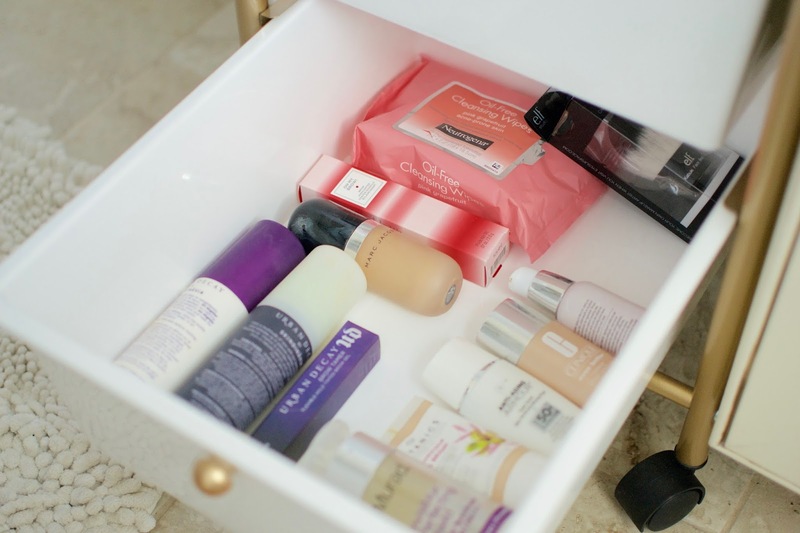 So for today's post I wanted to share how I organize my beauty products and how its made my life so much easier, especially in the mornings. For a long time I had things all over the place in my office and it would drive me insane. I would literally keep things in the boxes they came in because I just couldn't figure out who I wanted to organize everything in a way that made the most sense. I keep a majority of the gifts sent to me but sometimes things like foundations and concealers aren't my color so I give them away but for those things I want to keep in stock to use later on I found a really good way to keep everything organized. One of my Christmas gifts was a really cute bookshelf with little doors on the bottom to store things in. I purchased plastic storage boxes (shoe-size) from Target and labeled them: "lips", "eyes", "beauty", etc... truly life changing. I am such a freak when it comes to organization, it can literally put me in a bad mood when a room is a mess. No lie, that's a confession. Shamelessly. But when it comes to my beauty/makeup products that I use more often, the bathroom counter wasn't cutting it. There was constantly a mess on there and I truly couldn't take it anymore. It took forever to find the perfect organizer with drawers that would fit in this little space in my upstairs bathroom. Finally, I ended up finding one at Home Goods for just $30! Isn't it so cute? It's perfect of my space. In there I keep things I like to use more often. Like different blushes, bronzers, lipsticks, eyeshadows, etc. As well as a variety of moisturizers and things I want to try soon. 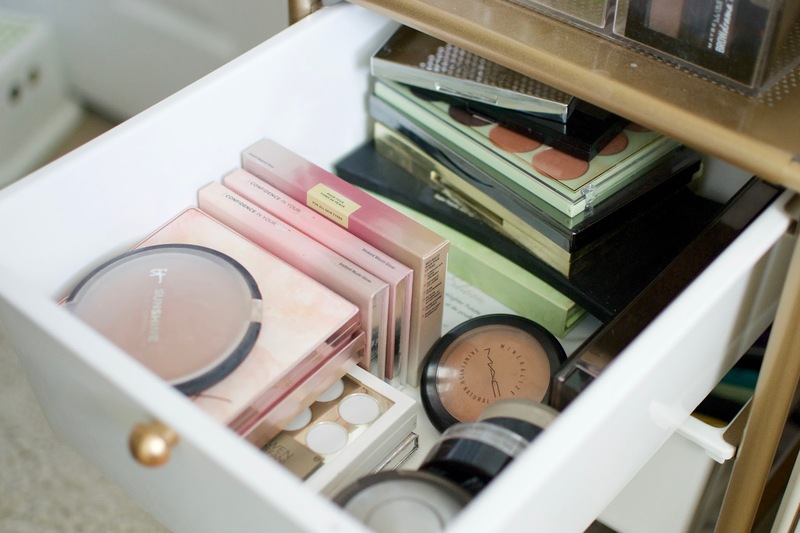 It's makes my life so much easier especially in the mornings when I am getting ready and I don't have to waste time looking for things. It totally helps that it's super cute and chic. 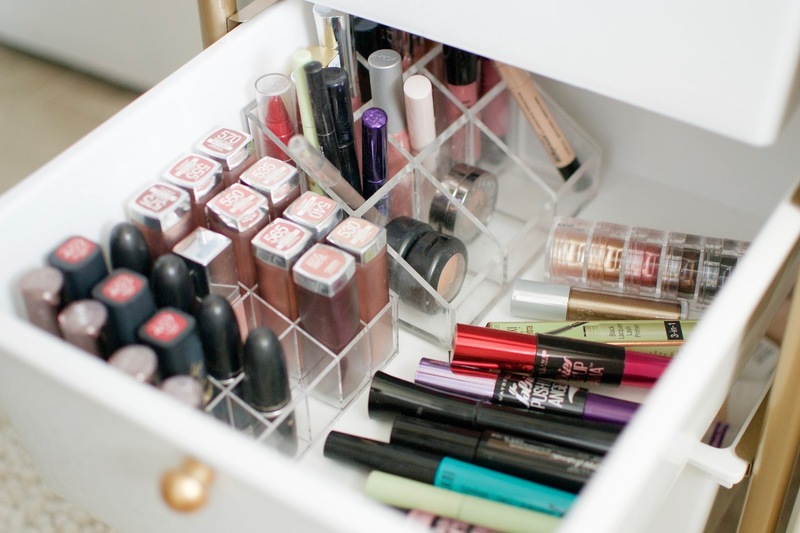 The drawers are nice and big so I am even able to fit my acrylic makeup organizers in there. There is truly nothing like being organized in my eyes, it honestly gives me so much satisfaction, it's like a stress reliever for real. 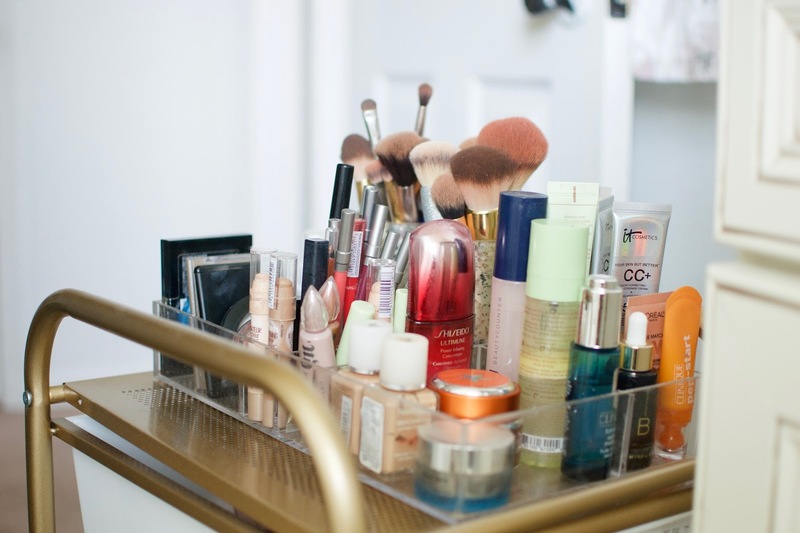 I hope you enjoyed my ideas on how to organize your beauty products. 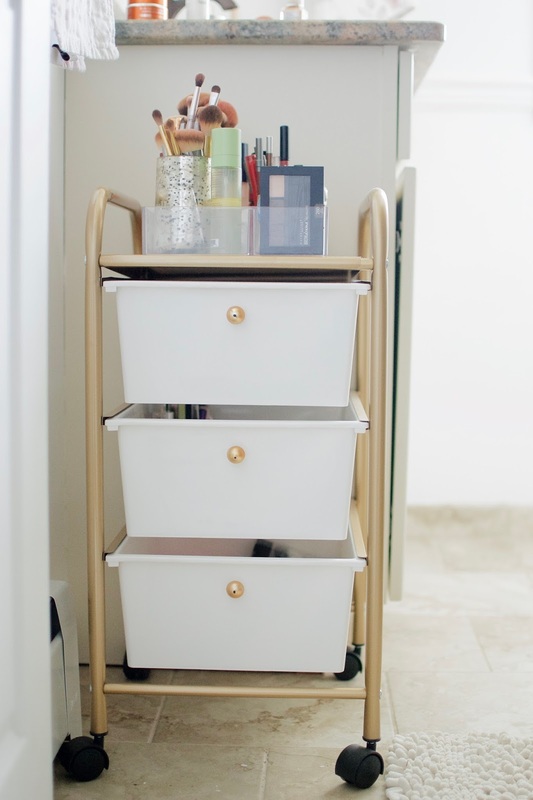 I've seen a few different styles and sizes at Home Goods in the office aisle, so if you're looking for how to organize beauty products in the bathroom I hope this idea helps:) A big plus? I've seen most of them for under $50.